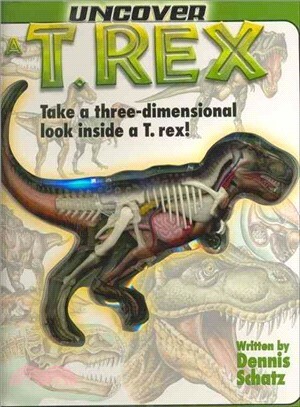 Uncover a T-Rex: Take a Three-Dimensional Look Inside a T.Rex! The Uncover series combines the best elements of a book with model elements to help readers truly "uncover" the mysteries of what makes things work. A fascinating three-dimensional presentation allows in-depth, hands-on exploration of the subject at hand. This unique "model" is easily built, deconstructed and re-built layer by layer, system by system just by turning a page, until an understanding of the topic is achieved. Uncover a T. Rex examines the structure and fossilized bones of the most powerful meat-eating animal to ever live on land. Learn about scientists' theories and observations and how they came to their conclusions, Discover where T. Rex fossils were found in the U.S., if they were hunters or scavengers, if they were related to birds, and how fast this enormous animal could run. Dennis Schatz is an internationally known science educator. In addition to his 11 children’s books, including several other Totally titles, he has written four teacher resource books. He has also led the development of several internationally touring exhibitions, such as: Dinosaurs: A Journey Through Time, Whales: Giants of the Deep, and Aliens: Worlds of Possibilities. Mr. Schatz is Associate Director of Pacific Science Center. Christian Kitzmueller gained his basic artistic education at the Kunstgewerbeschule Zurich. Since 1988 he has worked as an independent illustrator. His clients are primarily in the advertising and magazine industries. Davide Bonadonna puts his talents to good use on medical-scientific and naturalistic subjects. His illustrations are featured in numerous magazines by a variety of publishers. His work holds international appeal.